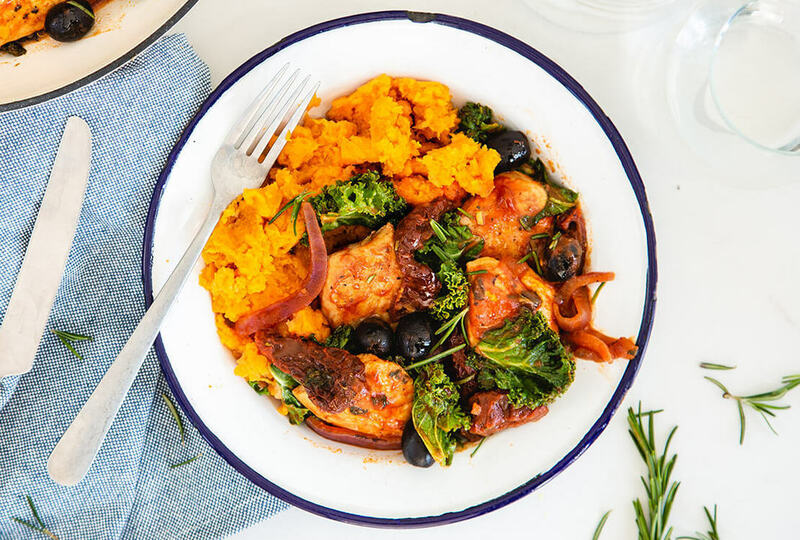 This traditional Italian dish has free-range chicken breast, fresh rosemary and black olives, making for a hearty stew served on sweet potato mash. With a healthy dose of kale because we love our greens. 1. Boil a kettle. Dissolve the half vegetable stock cube in a jug with 150ml boiling water. 2. Peel and cut the sweet potato into 1cm cubes. Thinly slice the red onion. Roughly tear the kale and roughly chop the rosemary (discarding the stalks). 3. Slice each chicken breast into 3 pieces. 4. Place the sweet potato in a saucepan, cover with boiling water and simmer for 10 mins until softened. Drain, mash, season with a pinch of sea salt and black pepper and keep warm. 5. Meanwhile, in a medium-sized pan, heat 1 tbsp oil on a medium heat. Add the chicken and cook for 2-3 mins each side, then add the onion for 3 mins. 6. Add the passata, vegetable stock, sundried tomatoes, black olives, kale and rosemary to the pan and simmer for 10 mins until the chicken is cooked through and the sauce has thickened. Season with black pepper. 7. Spoon the chicken cacciatore into two warm bowls, alongside the sweet potato mash.